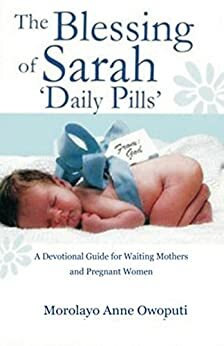 Morolayo Anne Owoputi is the author of the books 'The Blessing of Sarah' and 'The Blessing of Sarah Daily Pills' A timely and expository book on God's clever way to overcoming barrenness, fibroid tumors, miscarriages and complications in delivery. The books have received praise and recognition from many. Above all, testimonies are pouring in already from all over the world. She believes there is a making power in the blessing, and that the blessing of Sarah by God was what made her to conceive a son and become a mother of many, going by Genesis 17:16 account. Her relentless passion to see women fulfilled in this fruitfulness of the womb led her to writing of this supplementary prayer book 'The Blessing of Sarah Daily Pills'. She is a chartered Accountant with ACCA and ACA qualifications and holds a Masters in Economic Governance & Development Management from the University of Birmingham, United Kingdom under the Chevening scholarship scheme. She was shortlisted based on her fervor for Africa's transformation and her nation's development. Morolayo is an astute believer in the fulfillment of womanhood and humanity. She is a lover of God and member of the Daystar Christian Centre. Currently, she is garnering more skills for the execution of Nation building projects. She resides in Lagos Nigeria with her family and blessed with a son.